When Sophie Sulehria and husband Jonny Baker shared their struggle with IVF many readers got in touch with their own experiences. Here are some of their stories. “I had struggled to conceive our first child and my first pregnancy was an ectopic,” said Rena Miras. The teacher, from Sutton Coldfield, near Birmingham, said she contacted an organisation that matches families with egg donors and underwent numerous tests and counselling to prepare her. “In January, I started injecting [IVF drugs] and 10 days later I had egg retrieval,” the mum-of-three said. “They managed to get 19 eggs, all of which are for my couple if they want siblings in the future. “Egg donation is anonymous until the child turns 16 and they can then find out information about me. “I cried so much when I found out my couple were pregnant with a girl and they are due near Christmas. Hairdresser Maggie Joslin suffered with severe endometriosis after the birth of her first daughter. She turned to IVF to help conceive another child. “I was quite driven to have [another] baby but my ex-husband felt we already had one daughter,” says Ms Joslin, 56, from North Bradley in Wiltshire. “I was quite ill afterwards and also suffered from depression and he couldn’t cope. “It was gruelling emotionally and physically and it led to the end of my marriage. “I was in hospital for nine weeks after giving birth and have been left with all sorts of health problems. “My partner Stacy and I had to have IVF after discovering she had polycystic ovary syndrome,” said Chris Hayter, from Yeovil in Somerset. “After two rounds of IVF and four frozen cycles we were left heartbroken that we still did not have the baby we so badly wanted. After researching clinics in London and Greece the couple decided to travel abroad. “Their success rate was so much higher and not only that but the money would provide us with two full cycles and cover us living in Greece for a month,” the 34-year-old said. “We went through the first cycle and finally got the positive we were looking for. We now have a beautiful 18-month-old daughter who we have called Athena. 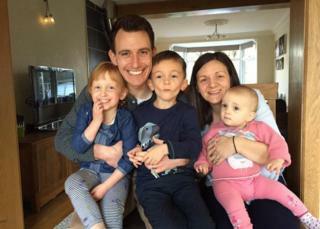 “My wife Nikki and I funded two rounds of IVF in 2009 after we had trouble conceiving,” said Matt Dunne, 40, from York. “We agreed we would not do more than two rounds as we had heard horror stories of people continuously trying and spending fortunes on it. “Our first round was a positive experience and we were extremely hopeful. When it didn’t work it felt horrendous, like we had lost something. “However, the second time we had zero expectations and it was an awful experience. When it didn’t work we didn’t even shed a tear and we were glad it was over. “We tried adoption and now have two wonderful boys who we are so lucky to have. “We have a number of friends for whom IVF has worked and others who, like us, it hasn’t and the emotional rollercoaster is so painful and traumatic. “After four devastating failed attempts at IVF over about six years my husband and I decided to go down the adoption route,” said Katie, whose name has been changed. “It was the best decision ever. We adopted a little girl at the age of 15 months, she is now eight years old and is a dream come true. “I honestly feel like I gave birth to her but just can’t remember that part. I couldn’t love her any more if I tried. IVF is so painful and expensive. “My husband has two children from a previous marriage so we did not receive any free treatments, which I don’t agree with.